Submitted by dennis on Tuesday, January 9, 2007 - 5:09pm. bam! 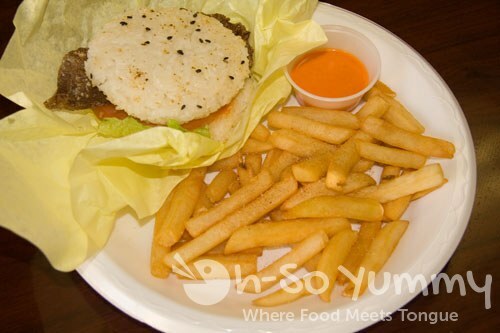 your choice of either beef, chicken or tofu on a bed of rice molded into the shape of hamburger buns. i decided to get the beef along with the combo of grape tea and fries. The fries were hot, fresh, and crispy. It was pretty good in the beginning but then i started to get tired of it. There was too much seasoning towards the bottom. As for the Beef Rice Burger, it was good, interesting, and quite innovative. I havent seen a rice burger anywhere else and they claim to be the only ones who make it. The owner recommended that I try the chicken rice burger next time, which I most certainly will.